Well pumps. Dug wells. Drilled wells. Rural homes rely on wells for their water needs. 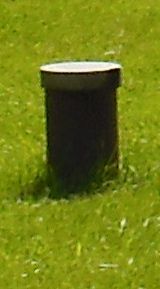 Wells less than 25 ft. or 7.5 m. deep are considered to be shallow, while deep wells can be several hundred feet deep, depending on the water table. Well water should be tested periodically. Well pumps. There are several well pumps available. Submersible pumps, for deep wells, are located within the well itself. All other pumps are either located on top of the well in a pump house or in the basement of the house. Well location. The well should be located at least 50 ft. (15 m) from the septic tank and 100 ft. (30 m) from the septic bed. Storage pressure tank. This tank not only stores water but also provides pressure to operate fixtures within the house. Air within the tank forces the water out and as the pressure in the tank drops, a pressure switch activates the pump and more water is forced in the tank. When the tank becomes water logged, pressure in the house will drop and the pump will turn on and off repeatedly. Adding air to the tank will solve this problem. Newer tanks cannot become water logged because they are equipped with a bladder which keeps the air and water separated. - Cleaning the foot valve at the bottom of the well. - Recharging or replacing the storage pressure tank. Dug wells are holes in the ground dug by shovel or backhoe; it is excavated below the groundwater table until incoming water exceeded the digger's bailing rate. 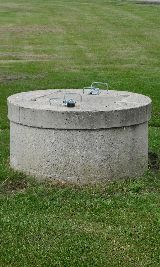 The well is then lined to prevent collapse and it is covered with a concrete cap. It is often difficult to dig beneath the ground water table, so dug wells are typically not very deep (10 to 30 feet or 3 to 10 m). Drilled wells can get water from a much deeper level by than dug wells. Most well drilling machines are mounted on large trucks, trailers, or tracked vehicle carriages. 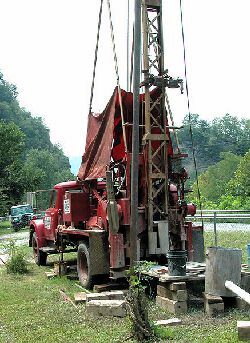 Drilled water wells typically range from 20 to 600 feet (180 m) or more. Water softeners. Water from deep wells is often hard due to the presence of calcium and magnesium. It may also contain iron and sulphur. Water softeners, containing a mineral called zeolite, exchange the calcium and magnesium for sodium. Sodium is replaced by adding salt to the brine tank. The soft water is usually supplied to the water heater only. The waste water is discharged into the sanitary sewer. For more on water softeners click here.